Had I been taught differently, life for me would have taken a drastic turn. Fear, limitations, uncertainties , doubts, confusion and loneliness would all be unknown to me. But truth be told, I’m grateful they are! Had I not had them as a part of my experiences I wouldn’t be able to relate to you today. And that alone makes my heart smile. When I was in my single digits I can recall wanting to be just like Jesus when I grew up. I loved the idea of telling stories that taught love, kindness and right from wrong. To be able to heal the sick with a touch from my hands was magical. Jesus was the man I wanted become like — UNTIL, I later learned he was killed because of it. My inexperienced mind figured evil conquered good. I mean how could it not? Here was the son of the God that created everything, yet, not even God could have protected him. So of course, becoming like Jesus was no longer a dream I was looking forward to living in real life. As I look back today I realize the more I attended churches the further I moved away from God, Jesus/Christ, faith, love and goodness. Every service I attended I was reminded of how unworthy I was of God’s grace, goodness and love; of how my imperfections were going to send me to burn for all of eternity; and how nothing I do will ever be good enough for God because the flesh that I am is weak and will never enter through the pearly gates of heaven. Then again why would I want to? The God I was introduced to was egotistical, moody, narcissistic, untrustworthy, and a liar who couldn’t get it right (Noah and the Ark). The way I figured it I would live how I wanted to while I was alive and (if God willing 😜) I would ask for forgiveness right before I took my last breath. And if I didn’t get that opportunity I knew a slew of individual who would be accompanying me while I occupy my space in the fire and brimstone of hell. It wasn’t until my awakening experience did I come to know otherwise. Everything I learned was false…EVERYTHING. From life, death, Satan/devil, evil, hell, and most importantly God. Upon my unification with all there is; detached from the physical body and this time/space reality, life as I knew it perished and a new life for me began. A rebirth of the soul being (logic [thinking], emotions [feelings] and will [doing]). No longer was the ‘person’ moments before the experience occupying the vessel . “She” was gone — — LITERALLY. In an essence she died that day. That day I became a blank slate with an overwhelming urge to learn. Coming back with the knowing I am spirit I became reborn/born again. Another thing I had all wrong. You see, I was under the impression I had to go to an actual building where services were held, placed and in a pool/tub of water, repeat a few lines and then dunked before becoming saved and born again. Boy was I misguided, misinformed and miseducated. Becoming ‘saved’ and ‘born again’ one must experience a paradigm shift. A great shift in awareness of the absence of ‘self’. Being born again is not just merely ‘accepting‘ Jesus as Lord and Savior. It’s about standing as one of God’s offspring where God is the only Father of the spiritual YOU. An empirical knowing God is all there is and from God’s womb birthed You. Not the ‘you’ seen in the mirror either. I’m talking about the ‘YOU’ aware of what’s viewed in the mirror. The Presence in back of the physical. The awareness — The consciousness. God morphs Itself into everything seen and unseen; known and unknown; visible and invisible. There is nothing created that was not created out of God. Are you getting this? The same exact Stuff God is made up of is the very same stuff we are created from. For, it was only that Stuff available. In other words God is being multiplied within Itself. The division comes with the Law of Polar where out of one thing arises it’s counterpart. “In the absence of what it is not, that too is not.” (Abraham Hicks) In other words, everything became a thing out of contrast. There has to be something already in place to compare it to to give it name based on its nature, characteristics, function, etc. This gives off the illusion of duality. In fact, this is how the devil came to be. In order for the devil to be the devil it’s nature, characteristics, function, etc. must be opposing to God’s. Now a mythical creature has been made alive in the minds of so many. To believe there can ever be an opposing force to God is to have never known the Father. And to know the Father you would know our Father cannot be divided or restricted. Only experienced on multiple levels in forms of vibrations and frequencies. “If God was all there ever was then what would God use to create with and from?” The answer: Itself. “How is God able to appear in so many forms and functions as It does as the creation?” The answer? That’s what energy does. The minute moment just before the first spark of light there’s a Presence. As Presence It is Power. A still Force up until the first movement. This movement is not the beginning of God but the first sign of God’s existence. As energy, God transfers, transforms and transmutes Itself. Taking on forms along the way. Essentially, God is interacting with Itself. We are just here to help God along. When I began to have more and more of my questions answered the more I understood the nature of God and my exercising of faith strengthened. Because each day God’s Love becomes clearer to me, while never ceasing to blow me away. Especially when I read the Bible. 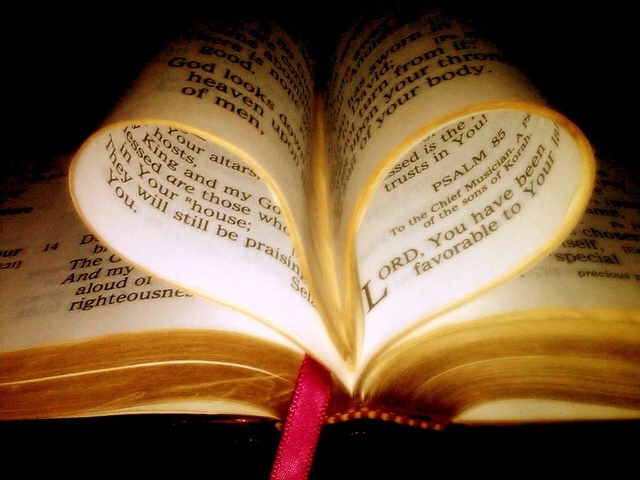 I know the Bible to be a love story between the Creator and Its creation. If studied metaphorically the reader will come to realize the Bible is a Book about them. It’s the spirit body’s personal manual for their human experiences. Unfortunately not everyone reads the Bible from this perspective. There are some folks out there who takes the words of the Bible literally as a history book prophesying doom and damnation. And there are others who believes the Bible is an evil tool filled with b.s. Either way, the message is lost. I’m not too hung up on the presentation of the Word of God as I am the message. I’m not stupid. I can figure it out for myself. Just as long as it makes logical sense through analytical reasoning and deduction. I’m good. I guess that’s why I love the Amplified version of the Bible. It provides me with a deeper understanding of the scriptures. Upon discovering the true nature of God and how God creates, along with why, my whole outlook on life shifted in a way unimaginable. Showing me God is not limited to what we are. God does it all.